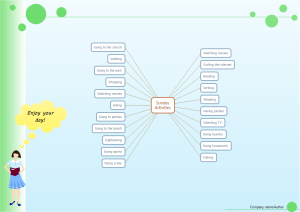 Below is a mind map example of activity plan created by Edraw mind map software. Users can simply use this example as a template to design your own activity plans. The Activity Plan Mind Map template can save many hours in creating great mind map by using built-in symbols right next to the canvas. You can download and modify this activity plan for your own use. 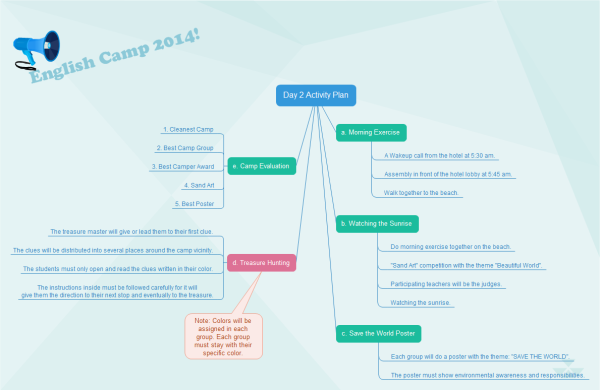 Discover why Edraw is an excellent program to create activity plan mind map. Try Edraw FREE. 1.1 A Wakeup call from the hotel at 5:30 am. 1.2 Assembly in front of the hotel lobby at 5:45 am. 1.3 Walk together to the beach. 2.1 Do morning exercise together on the beach. 2.2 "Sand Art" competition with the theme "Beautiful World". 2.3 Participating teachers will be the judges. 3.1 Each group will do a poster with the theme: "SAVE THE WORLD". 3.2 The poster must show environmental awareness and responsibilities. 5.1 The treasure master will give or lead them to their first clue. 5.2 The clues will be distributed into several places around the camp vicinity. 5.3 The students must only open and read the clues written in their color. 5.4 The instructions inside must be followed carefully for it will give them the direction to their next stop and eventually to the treasure. 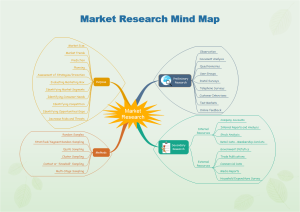 This market research mind map template is well-designed. Use it to train your employee on market research. Or modify it to illustrate other topics.